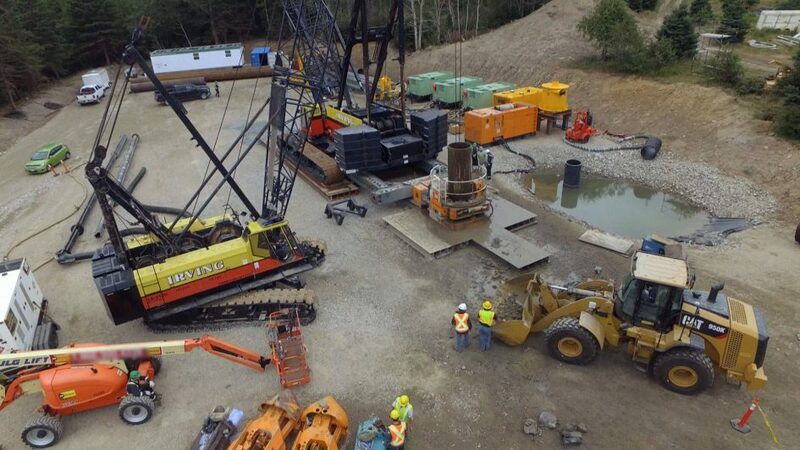 Heavy machinery excavates The Money Pit on The Curse of Oak Island. Mother Nature laid waste to Oak Island, as extremely violent storms literally washed away the South Shore Road. And then there was actual tragedy. Maybe the place is, in all actually, cursed. Season 5 had a rocky and solemn start as Rick Lagina and Charles Barkhouse arrived at the property to discover the main road is missing. Apparently there were some incredible storms taking place there that practically washed away the primary entrance. Without much time, the crew must completely reconstruct the road before this season’s heavy machinery arrives and they lose even more valuable time. Just like that, the team is already under the gun. The two-hour season premiere focused on Mother Nature’s wrath and the crew’s hopes of finding previously hidden secrets. This year’s plan: To drill an estimated 40 six-inch-wide bore holes to the depths of up to 200 feet. This pattern drilling will be done to get core samples in order to find the island’s original Money Pit. Could be a longshot, but if this episode is any indication for the rest of the season, it could be a pretty good one for finding artifacts. Due to inactivity for the past six months, the crew thought they’d take another shot at filming what exactly is inside the C-1 chamber. With another year of improving technology, they got the best video yet, this time in incredible HD and they actually found more than a few random items peeking through the sediment and debris that coats the bottom of the shaft. What looks to be a hook lying against a rock wall, interwoven metal pieces and the golden curved object returns once more to tempt the treasure hunters. Even odder: The guys identify “the shackle,” a chain that could signify a treasure is actually buried 170 feet below ground… or it could signify one of the slaves who originally dug the shaft and was basically buried alive many years ago, according to legend. Naturally, they call in their accomplished diver to take a look down there and once more, they’re re-introduced to the “Oak Island tease.” He found none of the above listed items, but did find a metal shank attached to the wall, which he unsuccessfully attempted to remove before almost running out of oxygen. Thankfully, a decompression chamber was brought in this season to fight “the bends,” hypothermia and other sicknesses, as paramedics remedied the diver’s symptoms. Also noteworthy: As he returned to the surface, the diver tried to scooped up some souvenirs from the bottom of the shaft, but no treasure was to be found on that day, other than a lot of muck. Metal Detection Expert Gary Drayton finds a gold coin, but this discovery was not the primary focus of the storyline. Tragically, Craig Tester’s son passed away at the age of 16 earlier this year, right before production of this season began. The “Fellowship of the Dig” remembered the child and showcased him in a few flashbacks from past seasons. Apparently, the season premiere received a 0.8 rating on the network, which was one-tenth higher than its Season 4 premiere last year. That seems like pretty good ratings for the History Channel. Briefly looking ahead to the upcoming episodes, this might be the season of making major discoveries. The sneak peeks gaudily proclaim this is the final season of the island’s mystery, which will finally be solved. Whether that’s the case or not, it’s an intriguing proposition. We’ll be watching and eagerly anticipating the crew’s every move.